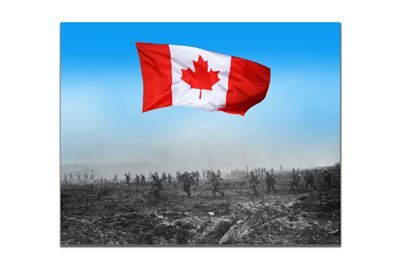 A hundred years ago the Canadian Expeditionary Force began an operation that would become a defining moment in Canadian history. Soldiers from all accross Canada joined forces, and fought together for the first time, becoming a symbol of Canadian unity and nationhood. For this picture I didn't colour the soldiers or the battlefield, leaving the original B&W to symbolize the dire days of war. The battle may be a time we look back on a symbol of Canadian sacrifice and achievement, but those were dark days indeed. The dark shades also provide contrast with the bright blue sky, and the bright red of the Canadian flag. The bright colours ... symbolic of the brighter days ahead, and Canada's great future. A flag that would not exist for any years, hangs over the battlefield, tying together our past, and our time.